I've come a long way from my terrified view of bugs and creepy-crawlies and it's only because I decided to realize that we are all connected in some divine rhyme or reason, so if I was going to love all the cute little critters and beautiful birds, I was going to have to deal with my fear of bugs. Of course, I don't think we have much of a chance of changing ourselves no matter how stubborn and full of will power we are ... it's only God's grace and love for us as we seek to be better people that He enters in and makes amazing changes in our lives. Okay, maybe coming to love bugs isn't so amazing to most folks, but having had two traumatic experiences with bugs as a young adult, it was amazing to me! So when we moved into our first home that had woods all around it, I asked God to change my mind about bugs. He began gently with me showing me such interesting things as stick insects and praying mantises which were so different from the bugs I'd been afraid of. I focused on thinking of how creative God is to be able to come up with so many varied designs with thousands and thousands of species. It certainly makes me consider that He has no trouble handling my problems, so it makes it easier to trust in Him. 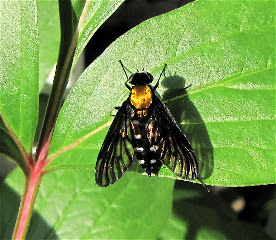 We don't use chemicals and insecticides in our habitat because of the birds, so I'm always looking for new bugs to learn their names and whether they be friend or foe. 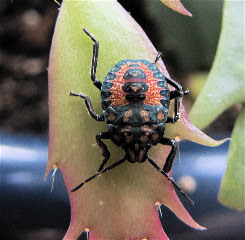 Stink bugs aren't known to be a friend, although there is a predatory stink bug that is. This guy is creating a lot of problems in our area of the country with crops and gardens. We don't have a problem since this is actually the only one I've seen in my many wanderings around our garden. I doubt many of the eggs and larvae survive the harvesting of all the bird parents searching for baby food. Besides, one person told me he had an invasion of stink bugs in a home he was building in Pennsylvania. When the house was left for a period of time, spiders seem to build webs everywhere and by the time they returned they noticed oodles of dead stink bug remains beneath the webs. I love it when nature is balanced enough in an area to make things right. Some bugs are just pretty to me, and the pair of mating hoppers were just that with their tiny orange eyes against that lime green body. They're not considered a friend, but I've not seen an abundance of them, so I consider them to be delivered meals for our hungry residents. 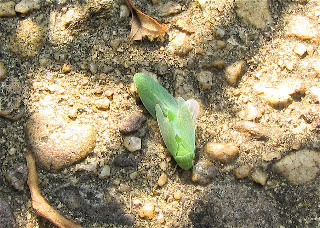 Bugs we have that like leafhoppers are praying mantis, assassin bug, robber fly, and damselfly. However, I'm willing to bet it was one of the birds that placed the order since we've got many feeding wide-open mouths all day long. 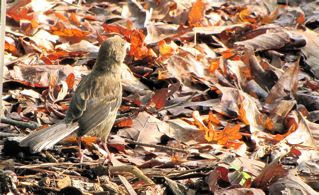 We have chickadees, purple finches, sparrows, titmice and wrens that love to eat leafhoppers. So, it's always wonderful to see a tiny bit of the "whole picture" of how God designed all of this to work, here in our own backyard. On Sunday I was amazed to see a number of new additions to our habitat. This time of year everything seems to duplicate itself and on Sunday I had plenty of evidence in the baby birds that were at various stages of growing up. The red-bellied woodpecker baby was still chattering away trying to convince it's mother that it was going to die if she didn't put one of those bugs into its mouth that she as digging from the bark of the dead tree no more than 2 inches beside the baby. Get a clue, little one. Watch and do as Mama does. Then there were 3 baby house finches that made me giggle as they practiced their flight paths and missed the branch landing or couldn't figure out how to approach the feeder's perches. I thought we had one lone grackle that had decided to stay with us instead of moving on with the group, but I saw a young 'un following an adult, so I guess that "one lone bird" wasn't always the same one. There had to be a pair to make the cute little grackle. My favorite delight of the day was to see a young Brown Thrasher. He wasn't out of the nest but for a day or so and he didn't have a fear of me at all. I could get within 6 feet of it which I certainly enjoyed for the view, but not for its sake. Although I'm quite certain the parent was nearby and knew it was a safe situation. One day we will have birds on our arms, critters lying around our feet, and our heads on a lion's tummy as we gaze at the beauty of Heaven. June 25th is this year's annual Great American Backyard Campout date. We didn't know about this event when our son was growing up, but it's never too late to have a good time. Besides, this is the year for my 60 new adventures, so why not!? We no longer have a tent and I don't think I'd make it sleeping on the ground for more than 10 minutes with this current body, so we're going to adapt it to sleeping on the screened porch on our chaise chairs. Adapt and be flexible, right? Here's an article with activities you can do while you're "camping out" in the yard, especially if you have children to keep entertained. You can make this a neighborhood event by getting other families to do the same ... choose one backyard and sleep under the stars and remember a bit of your own childhood delights. Surely you didn't lose all your curiosity and childlike joy of the outdoors. One of the things we've been wanting to do is to hang a white sheet or blanket up with a light shining on it to attract bugs. This is easily done on our deck with teh lamp that's on the wall. We'll just put a white blanket below it. There are some beautiful bugs out there, especially moths. When I was in Costa Rica at La Selva Biological Station, they had a place built with a roof and a white canvas with a light shining on it. There were some very interesting bugs that showed up there, so it was a favorite place to check-out at night since it wasn't but 50 feet from my cabin. One evening I saw a huge beautifully designed Orizaba Silkmoth. Such things cause me to realize the amazing endless creativity of our Heavenly Father. 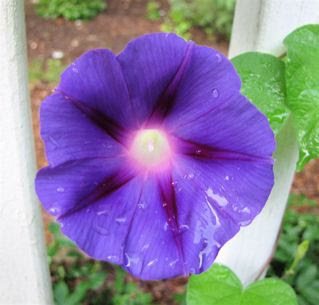 This is the first year I've decided to plant morning glories on the deck. The deer eat them up in the garden, so I thought I'd add them to the deck where I grow all the other plants they love to eat. I love the deer just as much as plants, so I don't mind keeping them 'hidden.' I sure was struck by its beauty one morning after a rainstorm. It reminded me that God's Light always shines through after the darkest of storms. When we abide in Him, we can shine in the midst of storms also. May God's peace overtake you on your most stressful day!